This past week, I watched an excellent movie, the Academy Award Best Picture nominated, “The Theory of Everything.” I’d recommend it to anybody, but it’s of particular interest to the disabled community, especially those of faith. 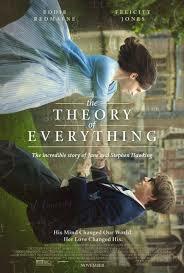 The movie tells the true story of the marriage of Stephen Hawking and his wife of many years, Jane. For those of you who’ve been living somewhere in the Artic tundra for the past half century or so and are unfamiliar with him, Hawking, widely considered to be one of the most brilliant scientific minds in history, has suffered from ALS since the early 1960’s. Despite fading motor skills, Hawking continued his research, writing, and lecturing. His example of making the most of whatever is given us is stirring. Similarly, his wife’s example as caregiver is inspirational. With three children and an increasingly disabled partner to care for, she performs her tasks with humility and, if the film’s portrayal is accurate, with little complaint. My quick review of the film is that it’s engaging, intelligent (it had to be, given its subject), and uniformly brilliantly acted. Eddie Redmayne, who portrays Hawking with skill and empathy as he ages and deteriorates physically, deservedly won the Oscar for Best Actor. Almost anyone in the film could have been considered for a performance award. One of the most striking aspects of the story for me is the contrast between the two. Hawking is a strident atheist, putting his faith 100% in science. Jane is a devout Christian. That difference causes some strife in their relationship, but both exemplify tolerance. Not knowing their story, it came as a complete surprise to me that it wasn’t Jane who gave up on her marriage in the face almost intolerable circumstances, it was Stephen. Jane had become involved in a romantic, though platonic, relationship with another man, but that wasn’t what caused the split. The other fascinating point was that each of them maintained their faith. Jane’s in God in spite of the trials her life had put her through and Stephen’s in science, in spite of the faithfulness shown by his Christian wife and the fact that, although he was initially given two years to live, he (miraculously?) survives to this day against the best forecast of scientific knowledge. In addition to being an entertaining film, there’s a lot to learn here for those with MS, their caregivers, as well as for Christians and others of faith. Mr. Hawking suffered with a devastating disease, it’s true. But he was also blessed with a brilliant mind, a loving, faithful wife, a healthy family, and a long and successful career and life. Yet, he would attribute all that to the luck of a random and impersonal cosmos. I prefer to thank my Creator for all my blessings. I have no scientific proof to offer for His existence, though I’ve had plenty of evidence pointing me in His direction. This entry was posted in Film, MS and tagged academy award, ALS, atheist, eddie redmayne, gratitude, hawking, oscar, theory of everything. Bookmark the permalink.